Allen David Broussard was a wildlife biologist working on his Ph.D. when he died from complications of treatment for Hodgkin’s Disease. We founded The Allen Broussard Conservancy as a way to honor our son’s legacy and continue his wishes of educating people on the importance of conservation and preservation. From a young age Allen expressed an interest in the wilds of the world. Growing up on the Crescent J. Ranch inspired him to travel across the globe to learn the impact that humans have on native habitats. The introspective young man understood deeply the connection that humans, animals, and the earth share. His last wish was that people would do everything they can to preserve and conserve as much of native Florida – and by extension the planet – as possible.. 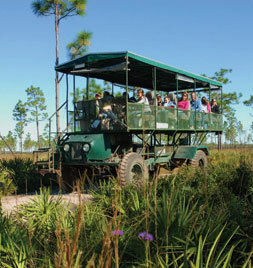 The mission of the Allen Broussard Conservancy is to: preserve and protect the fragile ecosystems of Florida’s native wilderness, to provide a permanent protective habitat for wildlife, to maintain the historical ranching operation, and to educate the public about the importance of conservation and the preservation of our unique ranching heritage. Acre by acre we hope to create a vast, absolute sanctuary for native plants and wildlife. Florida has a rich history, in both nature and society. The moment the Spanish set foot on the peninsula, Florida would be forever changed. 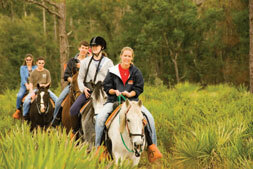 The Crescent J. Ranch represents the Frontier lifestyle that was shared by early settlers of Florida. The Cracker Cattle and Horses that inhabit the Crescent J. Ranch pay homage to the industry that enabled frontiersmen and women to forge a living out of the swamplands centuries before Walt Disney. These settlers changed the landscape to enable us to live here today. It is extremely important to teach this because it shows that no matter what you do you will have an impact on the land. The juxtaposition of the Ranch and the Conservancy prove that humans and nature need not always be at odds. Rather, that respecting the environments you inhabit can make a huge impact on the health of every ecosystem that surrounds you. Allen grew up in St. Cloud, Florida on our family ranch. From the get go, honoring history and providing a glimpse into the heritage of the land we inhabited was important for us. 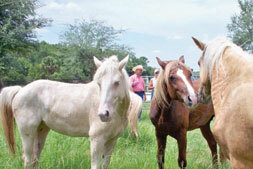 We chose to raise heritage livestock, Charolais and Cracker Cattle as well as Cracker Horses, on the Crescent J Ranch as an homage to the very first breeds of livestock brought over by the Spanish before Florida got its name. As a child, Allen reveled in exploring the, “Wild Lands” around the ranch. He took pleasure in watching the wildlife interact with the lush, untouched swampland. He saw how each depended on the other to balance the ecosystem. He noted how the slightest disruption could change everything. This observation took him across the world and fueled his desire to learn and research as he worked for a Ph.D. The day Allen told his father about his concerns at the disappearance of Florida’s natural beauty was one of the last days they would be together. He reminded his father of the wonder he encountered in the, “Wild Lands,” and remarked that they were quickly disappearing all around the world. He suggested that somebody needed to do something before they disappeared from this earth forever. His father promised he would do what he could. Being a man of his word, Dr. Broussard set out to make a difference. He learned that the land surrounding his ranch was divided into hundreds of small plots, each only a few acres. Over the years we have acquired most of this land. 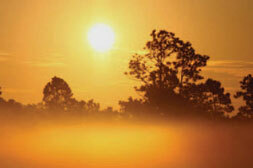 We founded Forever Florida, an adventure park, to fund the Allen Broussard Conservancy and attract visitors. Our mission is to honor our son’s legacy of protecting and conserving wild Florida while educating adventure seekers about the importance of conservation and caring for our earth. 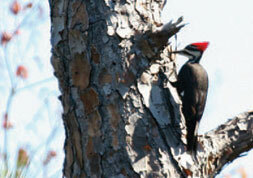 Today the Allen Broussard Conservancy lives on, continually acquiring more land to restore, conserve, and protect. Through the zip line Adventures, Horseback Riding, and Camp Illahaw the Conservancy is able to continue to protect wild, native Florida. Acquiring as much land as possible around the existing Allen Broussard Conservancy enables us to conserve and protect as much of native Florida as possible. To date, we have acquired nearly 90 percent of the available land around the conservancy. Acre by acre we hope to create a vast, absolute sanctuary for native plants and wildlife. With the land we have acquired we have achieved that end. 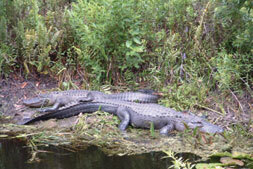 There is no hunting or disturbing any of the wildlife or habitats on the Allen Broussard Conservancy. With the help of Forever Florida, our reach will extend and we will be able to carve out a sizeable area where guests can be educated about conservation and preservation. This understanding can inspire them to do what they can to protect their environment and be a part of something bigger than themselves. Through Forever Florida we are able to educate Floridians and tourists alike about the rich natural history and heritage of Florida. Carefully selected guides who conduct trail tours, horseback riding, zipline adventures, and everything in between teach thrill-seekers about the unique and carefully conserved landscape they’re in. The aim of the Allen Broussard Conservancy is to teach. 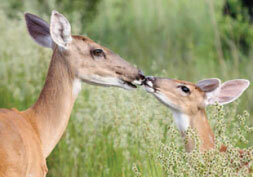 We teach to help people understand that this Earth can be saved and our native habitats and wildlife can be protected. When people come here and see what we’ve done to conserve wild Florida, they understand this. They come away interested in being part of conservation and see their efforts make a difference.